As usual, an example will get us started. Consider Table 1 that shows the number of touchdown passes (TD passes) thrown by each of the 31 teams in the National Football League in the 2000 season. A stem and leaf display of the data is shown in Figure 1. The left portion of Figure 1 contains the stems. They are the numbers 3, 2, 1, and 0, arranged as a column to the left of the bars. Think of these numbers as 10s digits. A stem of 3, for example, can be used to represent the 10s digit in any of the numbers from 30 to 39. The numbers to the right of the bar are leaves, and they represent the 1s digits. Every leaf in the graph therefore stands for the result of adding the leaf to 10 times its stem. One purpose of a stem and leaf display is to clarify the shape of the distribution. You can see many facts about TD passes more easily in Figure 1 than in Table 1. For example, by looking at the stems and the shape of the plot, you can tell that most of the teams had between 10 and 29 passing TDs, with a few having more and a few having less. The precise numbers of TD passes can be determined by examining the leaves. There is a variation of stem and leaf displays that is useful for comparing distributions. The two distributions are placed back to back along a common column of stems. The result is a back-to-back stem and leaf graph. Figure 3 shows such a graph. It compares the numbers of TD passes in the 1998 and 2000 seasons. The stems are in the middle, the leaves to the left are for the 1998 data, and the leaves to the right are for the 2000 data. For example, the second-to-last row shows that in 1998 there were teams with 11, 12, and 13 TD passes, and in 2000 there were two teams with 12 and three teams with 14 TD passes. Figure 3. Back-to-back stem and leaf display. The left side shows the 1998 TD data and the right side shows the 2000 TD data. Table 2 shows data from the case study Weapons and Aggression. Each value is the mean difference over a series of trials between the times it took an experimental subject to name aggressive words (like punch) under two conditions. In one condition, the words were preceded by a non-weapon word such as "bug." In the second condition, the same words were preceded by a weapon word such as "gun" or "knife." The issue addressed by the experiment was whether a preceding weapon word would speed up (or prime) pronunciation of the aggressive word compared to a non-weapon priming word. A positive difference implies greater priming of the aggressive word by the weapon word. Negative differences imply that the priming by the weapon word was less than for a neutral word. The data are displayed with stems and leaves in Figure 4. Since stem and leaf displays can only portray two whole digits (one for the stem and one for the leaf), the numbers are first rounded. Thus, the value 43.2 is rounded to 43 and represented with a stem of 4 and a leaf of 3. Similarly, 42.9 is rounded to 43. To represent negative numbers, we simply use negative stems. For example, the bottom row of the figure represents the number -27. The second-to-last row represents the numbers -10, -10, -15, etc. Once again, we have rounded the original values from Table 2. Observe that the figure contains a row headed by "0" and another headed by "-0." The stem of 0 is for numbers between 0 and 9, whereas the stem of 0 is for numbers between 0 and -9. For example, the fifth row of the table holds the numbers 1, 2, 4, 5, 5, 8, 9 and the sixth row holds 0, -6, -7, and -9. Values that are exactly 0 before rounding should be split as evenly as possible between the "0" and "-0" rows. In Table 2, none of the values are 0 before rounding. The "0" that appears in the "-0" row comes from the original value of -0.2 in the table. Although stem and leaf displays are unwieldy for large data sets, they are often useful for data sets with up to 200 observations. Figure 5 portrays the distribution of populations of 185 US cities in 1998. To be included, a city had to have between 100,000 and 500,000 residents. Figure 5. Stem and leaf display of populations of 185 US cities with populations between 100,000 and 500,000 in 1998. Since a stem and leaf plot shows only two-place accuracy, we had to round the numbers to the nearest 10,000. 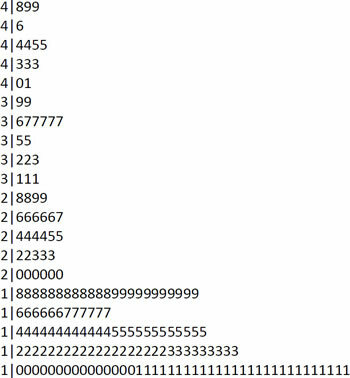 For example, the largest number (493,559) was rounded to 490,000 and then plotted with a stem of 4 and a leaf of 9. The fourth highest number (463,201) was rounded to 460,000 and plotted with a stem of 4 and a leaf of 6. Thus, the stems represent units of 100,000 and the leaves represent units of 10,000. Notice that each stem value is split into five parts: 0-1, 2-3, 4-5, 6-7, and 8-9.